Channel-16, specialist providers of license-free communication systems, have recently utilized an array of Green-Go Digital Intercom Products for Muse’s Drones tour. The tour, which has toured stadiums of the UK and Europe, pushes the limits of what a live production can be. Unlike many bands shying away from the production of concept albums, Muse’s latest release fully embraces the idea, something that is clearly reflected by their Drones tour. When a show contains such a level of technical production as Muse’s, with it comes the requirement for an equally high standard of communication. 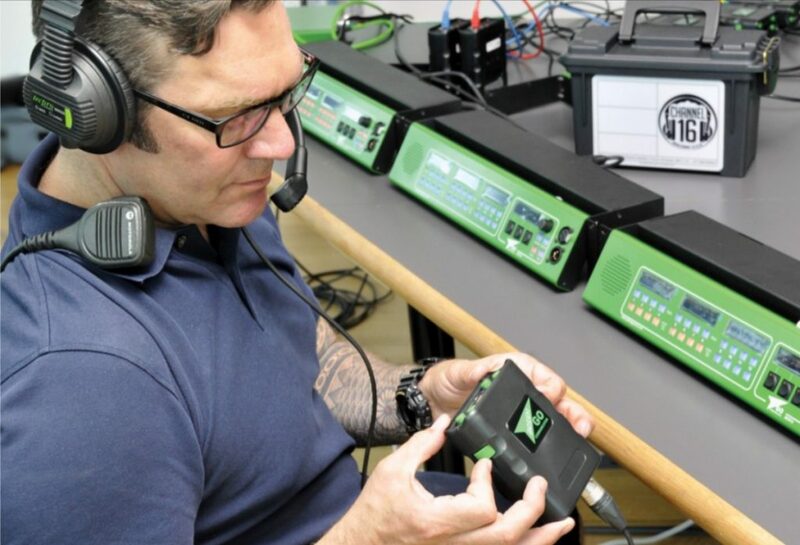 For a flexible and reliable system, Channel 16’s Managing Director, Paul English, turned to Green-Go’s Digital Intercom system. The dedicated and independent talk back system ran via PoE switches, which formed the fiber-backbone for the configuration. Show Caller for the performances utilized a 12-channel MCR12 desk unit, as did playback operator/backline manager and monitor engineer for the tour. Lighting designer and content designer both utilized an 8- way desk unit, with lighting associate on a designated wired belt-pack. Wireless Belt-packs were worn by two LED Masters and four set carpenters, as well as dimmer controller. A key element to the stage design for the tour was the inclusion of large, moveable screens, which provided additional video content behind the band’s performance. Each screen was designed to be able to move forward and backwards independently on the stage, on a runner system, giving an extra dimension to the set design. These panels were re-positioned throughout the show by a number of on stage carpenters, each needing their own cues as to when to perform their part in the carefully planned choreography. Paul English from Channel 16 created custom made harnesses, enabling the belt-packs to be worn on the chests of the carpenters. This not only enabled ease of access to the belt-pack controls, but also enabled the GREEN FOR GO function of the system to be in the peripheral vision of the operators, giving the ability to provide a visual cue as well as voice command. An additional floating wireless belt-pack was also made available for stage management, providing the freedom of movement around the venue, should the need for face-to-face interaction be required. Additional wired belt-packs were provided to FOH Audio and Lighting Associate, as well as BLACKTRAX operator and Video Interactive Operator. All of the local production crews, including follow-spot operators, were able to also link into the communication system. This was achieved by integrating their production radios into the system through the Green-Go Four Wire Interface. Other than the reliability of the system, Paul English and the rest of the team at Channel-16 found the system to have a great number of features that made it perfectly suited for use in such a complicated and intricate production. Paul English concluded by stating “We are excited by the developments that are constantly being undertaken by the team at Green-Go. We are already utilizing Green-Go’s wired systems for Muse’s stadium tour, as well as recent tours with Take That and other sporting events GOLF, and we are sure that this will be the beginning of a long-term relationship between Green-Go and Channel-16.